Signs of dry, dehydrated skin are obvious-though how to treat dry skin may not be so obvious. While slathering on extra thick, pricey cream seems the obvious solution, for this to be effective you’ll need to have some serious exfoliation first-enter the HydraFacial. Winner of LNE & Spa’s Best 4 years in a row & New Beauty’s Best In-Office Facial Treatment 2014! The HydraFacial MD treatment is the newest advancement in non-laser skin resurfacing. HydraFacial MD is the only hydradermabrasion procedure that combines cleansing, exfoliation, extraction, hydration and antioxidant protection simultaneously, resulting in clearer, more beautiful skin with no discomfort or downtime. The treatment is soothing, moisturizing, non-invasive and non-irritating-what more could you ask for? HydraFacial MD is a non-invasive, multistep treatment that combines the benefits of next-level hydradermabrasion, a chemical peel, automated painless extractions (no pinching!) and a special delivery of Antioxidants, Hyaluronic Acid and Peptides. It does all of this in one quick treatment that delivers real results without downtime or irritation. 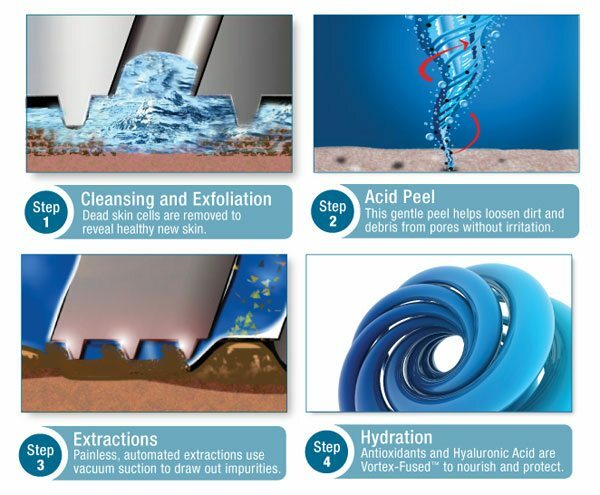 The HydraFacial MD treatment improves the appearance of fine lines, wrinkles, congested and enlarged pores, oily or acne-prone skin, hyperpigmentation and brown spots by using a customized chemical peel to go deep into the skin and ignite cell turnover, followed by superior hydration that is fused into the skin to lock in moisture and start the repair process. The HydraFacial MD procedure is suitable for most skin types, including thin or aging skin, ethnic skin, and dry skin or oily skin. Start your skin maintenance program now with HydraFacial MD to slow down your skin’s aging process and delay the need for invasive procedures today.